Some 90 years ago Prince Chakrabongse led a party of international aristocrats down the peninsula to hunt game. Shortly thereafter the King built a palace on the beach he fittingly named Klai Kangwon meaning "far from worries". Now, in the same relaxed style Anantara Resort & Spa emerges as a palace in its own right. Timeless and without worry. Nestled by the beach on the sunrise side of the Gulf of Siam, the spirit of Anantara offers a unique blend of traditional Thai architectural heritage, exotic interiors and natural tropical gardens that has made this Resort & Spa one of the most romantic hideaways in Southeast Asia. 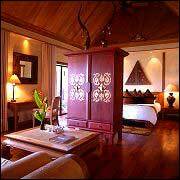 The deluxe rooms and suites reflect a mood of timeless relaxation in a rustic village setting. 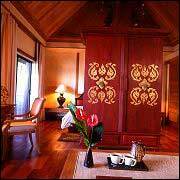 The Lagoon rooms offer an incomparable style of simplicity and elegance. 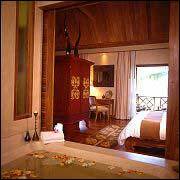 Bathrooms open into bedrooms that open on to expansive private terraces overlooking lotus-covered lagoons. Unwind in lush tropical gardens on a sun bed, enjoy a sumptuous dining experience in the privacy of your own terrace, take a dip in a free-form pool or spend time out at the Spa and discover the elixir of eternal youth. For the more energetic there are six championship golf courses nearby and a multitude of water sports to enjoy. The healing wisdom and traditions of the East are available through the services offered by Mandara Spa, an internationally renowned company specializing in traditional massage and body treatments. Our guests enjoy an exceptional spa experience, including world-class treatments and service. We offer a selection of traditional Thai Origin massage techniques. 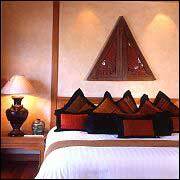 Swedish massage using a warm herbal oil or aromatic blend of local oils, and the Orient Blend massage which is a combination of Thai and oil massage. We also offer reflexology for the hands and feet and would be pleased to assist you with your selection. There's a unique style of service that is warm and friendly, unobtrusive, yet very attentive. Enjoy the superb culinary skills of our master chefs and the multitude of exotic blends and tastes. Water Sports, We have sail boats available for those wishing to get out on the sea. Our sail boats include Hobbie Catamaran 16, Laser and Concept 302. If you are a novice then lesson are available. Also available from our sports center are Sea Canoes. First take a trip to the local market to learn about the ingredients then return to the hotel and try your hand at cooking and learning about Thai techniques. Have a go at this beautiful craft that will brighten up your dinner parties at home and definitely impress your friends. Find out how to make your own garlands. 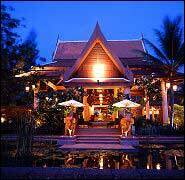 Learn a few basic phrases that will help you to explore Thailand's wealth and beauty. An introduction to the basic techniques of this ancient martial art. A kind of volley ball using the feet rather than the hand is a popular Thai sport. 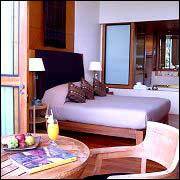 Click here to enjoy our Special Rate for Cha Am Hotels & Hua Hin Hotels. Guide to Hotels with Cha Am Map and Hua Hin Map or just click here to get directions to the hotel's map and to print out for Hotel's Address.